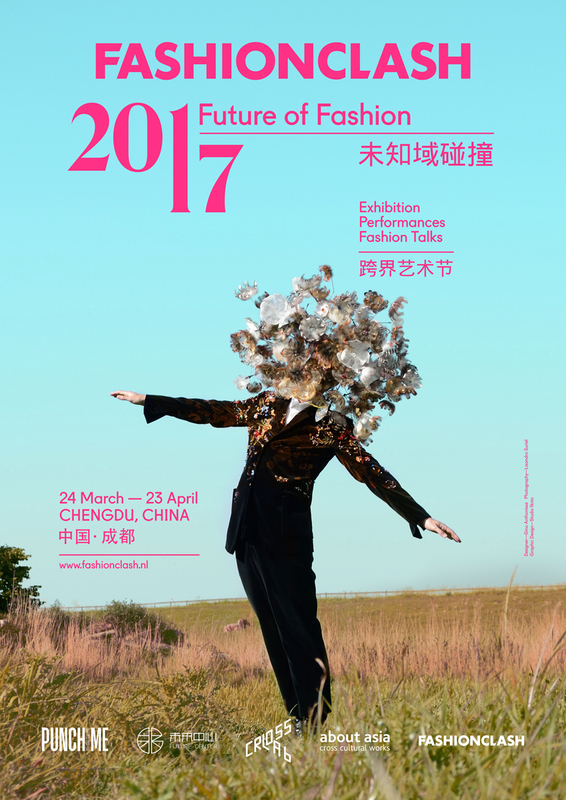 In March and April of 2017, Maastricht-based interdisciplinary fashion platform FASHIONCLASH, joined forces with Chinese partners Punch Me, Cross Lab and Dutch-Chinese organization About Asia to introduce “FASHIONCLASH 2017: Future of Fashion” in Chengdu. After a successful first exhibition of FASHIONCLASH in China (2015), as part of an exchange program between the cities of Maastricht (Netherlands) and Chengdu (Sichuan, China), FASHIONCLASH presented a larger, more comprehensive and complete story at the newly opened “Future Center” in downtown Chengdu from 24 March until 23 April. Future of Fashion ‘Future of Fashion’ is a multidisciplinary exhibition composed of work of over 30 emerging designers and artists from The Netherlands and Flanders. The exhibition represents a broad spectrum of fashion design aesthetics, visions and various approaches to fashion. The presented work stands out for its concept, experimental material and textile, innovative shapes and tailoring. In addition to fashion the exhibition featured screenings of interdisciplinary fashion films and performances. Among the participants were award winning designers like Marlou Breuls and Nikki Duijst, avant-garde designers’ collective Das Leben Am Haverkamp and promising theatre makers like Lotte Milder and Milou van Duijnhoven. The selection of participants was an eclectic mix of designers that graduated from schools such as AMFI, ArtEZ Arnhem, MAFAD, KABK, Royal Academy of Fine Arts Antwerp and Theatre Academy Maastricht. FASHIONCLASH gathered a team of theatre performers that brought the exhibition alive. Studio Dennis Vanderbroeck created an overall concept that served as a platform to connect the physical space of the exhibition with performance space and engage interactions with the audience. Partners In collaboration with the Chinese cultural initiative Punch Group and their cultural festival “PunchMe Art Festival”, FASHIONCLASH meets west China for the second time. The exhibition was staged in ‘Future Center’, an unfinished raw space within a building that perfectly fitted the spirit of the new generation designers and artists who are redefining the future with their visions. ‘Future of Fashion’ creations temporarily found their home in this space and inspired the audience with the potential that lays ahead. Anything is possible! Like in a labyrinth, FASHIONCLASH invited visitors to wander and get lost in imagination of the future fashion makers. The Chinese showcases of FASHIONCLASH were developed and initiated in close collaboration with About Asia; a Dutch-Chinese promoter of cultural and creative industries in west China. Performance and Scenography Specially for the ‘Future of Fashion’, FASHIONCLASH gathered a team of theatre performers to develop performances that would bring the exhibition to life. Studio Dennis Vanderbroeck created an overall concept that served as a platform to connect the physical space of the exhibition with performance space and that would engage with the audience. “The White Curtain Labyrinth” scenography concept designed by Studio Dennis Vanderbroeck for Future of Fashion, explored the idea of perceiving from a fixed perspective. On the one hand creating a highly aesthetic framed space with white pleated curtains and on the other hand visualizing a playful deconstructed space. Embracing the existing space and translating it to a performative spatial exhibition. Designers: Ailene van Elmpt, By vanharten, Annewil Ravensbergen, Anouk van Klaveren, Bluedenîmes, Christa van der Meer, Studio Dennis Vanderbroeck, Dewi Bekker, Ebby Port, NONOCAKE by Elke van Zuylen, Esther Haamke, Evie Cowan, Gino Anthonisse, Isis Elsa Fee, J.R. Sypkens Smit, Jivika Biervliet, Jorieke Tenbergen, JUDITHvanvliet, Kaho To, LAU – by Laura Verdonk, Lisa Konno & Karin Vlug, Maarten van Mulken, Christina Albrecht & Marina van Dieren, STOP by Marketa Martiskova, Marlou Breuls, Nikki Duijst, Draga Dina, Peer Cox, Rosanne van Wijk, Sanna Schubert, Steven Vanderyt, Yanaika Nuyts. Theatre performers: Mami Izumi, Anthony van Gog, Lotte Milder, Milou van Duijnhoven. Overall direction and scenography: Studio Dennis Vanderbroeck. FASHIONCLASH is an innovative, interdisciplinary development platform and international fashion network that focusses on supporting a new generation of designers and artists. Over the past ten years FASHIONCLASH has grown from a single project into an influential fashion statement by developing and organizing projects such as the annual 'FASHIONCLASH Festival' in Maastricht. The ‘clash’ in FASHIONCLASH represents the encounter between talent, cultures, artistic disciplines, the audience and fashion. FASHIONCLASH strongly believes that the art of fashion can stimulate critical debate about controversial issues in our society. By researching and questioning ‘fashion’ we learn to understand the psychology of human behaviour and its role in undermining stereotypes.